Sometimes after returning home, patients still need monitoring and nursing treatment through a home health agency. The care ARMS provides to home health patients is conducted in collaboration with primary care physicians, not in place of them. ARMS allows home health nurses and therapists to keep their care plans moving forward and proceed when the attending physician is unavailable. Being able to provide treatment more promptly benefits the patient and can ease stress on the patient’s family and other caregivers. The care ARMS provides to home health patients is conducted in collaboration with primary care physicians, not in place of them. ARMS allows home health nurses and therapists to keep their care plans moving forward and proceed when the attending physician is unavailable. Being able to provide treatment more promptly benefits the patient and can ease stress on the patient’s family and other caregivers. 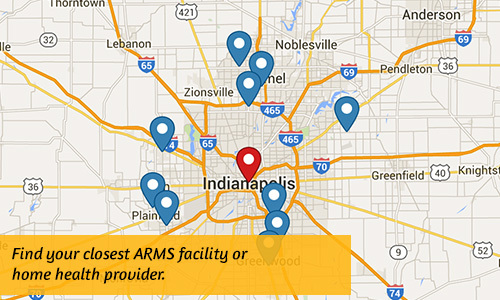 In addition to the direct on-call services to Great Lakes Home Health, ARMS also provides traditional medical direction to Preferred Home Health and Health at Home in the Indianapolis area.